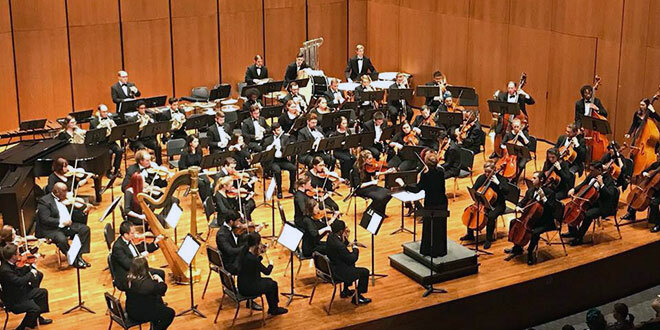 The Jacksonville University Orchestra will present a program of contemporary compositions on Tuesday, March 6, in Terry Concert Hall at 7:30 PM. The music, which is “hot off the press,” was all composed in the 21st century, with most of it written only last year. Featured will be the student winners of the Delius Composition Award from 2016 and 2017, alumna Anne McKennon and graduating senior, Daniel Farrell. Also featured will be JU’s own Professor of Theory and Composition, Dr. Jianjun He, and guest composer, Dr. Piotr Szewczyk, of the Jacksonville Symphony. The Delius Composition Award, named for English composer Frederick Delius who lived in Florida in the late 19th century and whose home sits on the JU campus, is given annually to the most outstanding composition student in the studio of Dr. Jianjun He. In addition to the honor of winning the award, the students are granted a commission to compose a piece for the JU Orchestra. “Many of these students have had small works performed by fellow students and sometimes faculty, but being asked to compose for a 65-member ensemble is quite a different task,” says Dr. Marguerite Richardson, Associate Professor of Strings and Music Director of the JU Orchestra. “When I joined the faculty in 2007, the student winners only received recognition—I felt that the orchestra could be a vehicle for the one thing composers want most: to hear their music performed live by real instruments and not on a computer!” Thanks to Richardson, these performances showcasing student and faculty compositions are a biennial event. Dr. Jianjun He will be on stage as a member of the violin section for his American premiere of Sonata for Strings. About the work, he says, “Sonata for Strings is a work of absolute music. It is, in general, a sorrowful piece which reflects the suffering of Chinese people including the composer himself. Combined emotional melody with conventional writing for string orchestra, this piece is pretty accessible to audience.” Written only for the string section of the orchestra, the piece is full of complex rhythms and angular melodies. The concert will be presented on Tuesday, March 6, 2018 in Terry Concert Hall at 7:30 PM, and is free and open to the public. For more information on the performance and any disabilities and accommodations, please contact the Division of Music at 904.256.7370. Learn more about the College of Fine Arts 2017/2018 Performing Arts Series. Skip the box office and purchase tickets for other CFA events through www.jutickets.com. This easy and efficient process allows you to print tickets at home, have them mailed to an address, or picked up at will-call the night of an event.